More than once, we have come within a breath of losing a puppy, or puppies. And as a parent, I worry about how I will handle the double devastation. Because too few people in Uruguay vaccinate or treat for parasites * puppies have neither immunity to diseases nor protection from parasites. Hans and Uma arrived so infested with parasites that their brains were already under attack, causing terrible seizures. Often, symptoms of diseases they have already been exposed to, or the infestation of parasites does not reach a life threatening condition until we are in a false sense of safety. 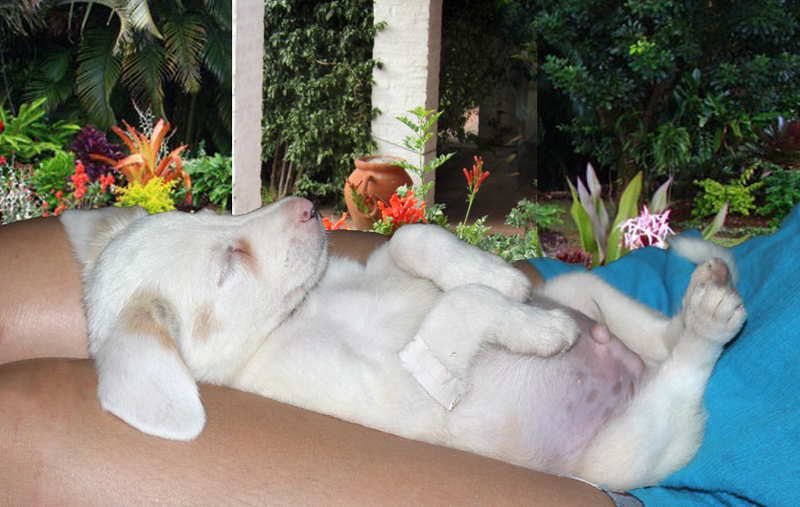 We are grateful for the loving care our pups received at emergency hours from our vet. While I confess a few tears were shed as we waited, Uma and Hans not only made full recoveries, but landed in the pink. us of how lucky we were not to lose him. The woman who found these little guys baking in the summer sun behind a dumpster became quite an advocate. "You know you hear people do things like this but you never believe it," said Perla. "Had we not have been out walking our dog, we never would have found the pups in time. It was our dog's incessant barking and pulling that made us look out back by the trash behind the store." to pay for and file extensive papers to allow them to cross the border.